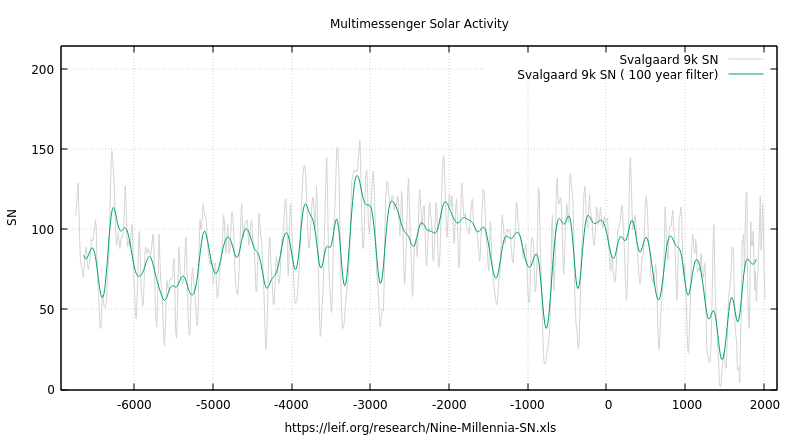 Svalgaard paper: Reconstruction of 9000 years of Solar Activity | Watts Up With That? Figure 1. (Left) Wu et al. (2018) reconstructed decadal sunspot numbers (dark blue diamonds) since 1600 AD. Undoing the down-scaling, yields the curve with light blue diamonds, but this is not enough to match the SILSO SN version 2 (red dots). (Right) A factor of 2.0±0.2 seems to be needed. 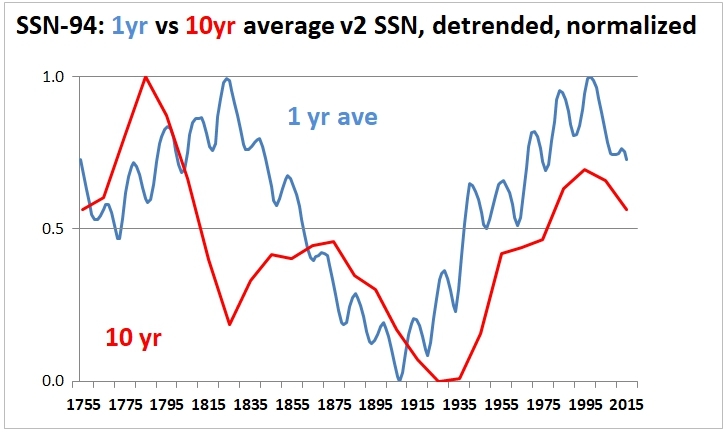 The SN value for the 1745 decade is treated as an outlier (open circle) as there were no observations for several years during the decade. Figure 2. Four centuries of reconstructed decadal sunspot numbers on the SILSO V2 scale. We have direct observations of sunspot numbers (bluish triangles), of sunspot group numbers (GN* bluish circles; the asterisk * signifies reconstructed values using the regression coefficients given in Table 1 below), of daily variation ranges (rY* bluish squares), of ring current strength (IDV* bluish stars), and of the corrected cosmogenic series (Wu* blue diamonds scaled up by a factor of 2, as per Figure 1; the original series is shown by the pink squares in the middle of the graph). Gray dots with a yellow center show the average of all the messages (with standard deviations shown by red diamonds at the bottom of the Figure). The number of values, N, in each average is marked by the thin dashed gray curve. Table 1. The published values of the decadal averages for the five messengers considered in this article are tabulated in columns 2-6. Columns 7-11 contain the their messages put on the SILSO SN Version 2 scale using the regression coefficients given in rows 2 and 3, e.g. Figure 3. A millennium of reconstructed decadal sunspot numbers on the SILSO V2 scale. The WEA reconstruction is shown by the black curve with their stated uncertainty indicated by gray shading. The (unphysical) slightly negative values around 1450 AD have been omitted. They may be a hint that the reconstruction is problematic for very low activity where the usual assumption of a spherical symmetric solar wind breaks down. The average Multimessenger reconstruction for 1615-2015 AD is shown by the red curve with the uncertainty band indicated by pink shading. The two reconstructions generally agree within their uncertainties. Figure 4. Nine millennia of reconstructed decadal sunspot numbers on the SILSO V2 scale. The WEA reconstruction is shown by the black curve with the stated uncertainty indicated by gray shading. The average Multimessenger reconstruction for 1615-2015 AD is shown by the red curve. Figure 5. Fast Fourier Transform of the combined nine-millennia decadal sunspot number and of three subsets: first half, last half, and middle half. The insert shows the interval from 60 to 250 years in more detail. You mean, stable main sequence stars are stable? I see 440y of data there , not 9ka . Wrong file ? Interesting stuff, hope to see the whole dataset. I’m curious why you chose to resample at 10y. Just because it’s a round number ? Averaging is a good way do reduce random noise, it is not good at removing a systematic signal. This seems an odd choice for resampling data were there is known to be a circa 11y periodicity. I will comment further when I have studied the methodology more closely. Columns A is the decade. Goes from 6755 BC to 2015 AD for 8770 years, 879 data points. The sampling was not mine, but was performed by Wu et al. Dictated by the resolution of the early cosmic ray data. Sorry, not reading clearly, I was confused by the layout. Long data fine. I wouldn’t know where to start. Looking forward to reading some expert analysis. I can relate. As an Instrumentation Engineer Data is what I do, But Solar Science must be the most arcane discipline in existence. To begin with could someone explain how figure 4 was created? The black bit is from Wu et al. (2018), until the red bit, which is Leif’s “multimessenger” reconstruction for AD 1615 to 2015. Methods. A new method, based on a Bayesian approach, was applied for the first time to solar activity reconstruction. A Monte Carlo search (using the χ^2 statistic) for the most probable value of the modulation potential was performed to match data from different datasets for a given time. This provides a straightforward estimate of the related uncertainties. We used six 10Be series of different lengths (from 500–10 000 yr) from Greenland and Antarctica, and the global 14C production series. The 10Be series were resampled to match wiggles related to the grand minima in the 14C reference dataset. The stability of the long data series was tested. John Tillman, Thanks for the response. The references are useful. But what I was really looking for an assessment as to why splicing two completely different proxies together is acceptable and how they made the two join up at the same point. Best to let Leif explain. But there is overlap between radionuclide proxies and observations in the 17th, 18th and 19th centuries, so splicing in this case might not be bogus, as with the HS. It always astounds me that scientists will take a cloud of data points and claim to find correlations and trends and stuff. The correlation shown in the graph is the correlation between the cloud and the straight line , not the cross-correlation of the two data sets. The fitted line ( the scaling factor ) will be somewhat under-estimated due to regression dilution but the data is not too spread out. This could be constrained by flipping axes and fitting the other way around. How close is the fit to 0.5 ? Javier and other cycle advocates will have an interesting time with this study. I can eyeball sort of a connection with sunspot numbers and temperature for the period around 1 to 1800, but nowhere else. Does seem to show MWP, LIA and recent optimum could be solar. We note that a ~100-year quasi-wave is clearly seen by eye over the last three centuries (only) and also that there has not been any significant secular change (e.g. an often claimed increase) over the same time interval, the lack of which had already been established (e.g. Clette et al. 2014). However, that 300y period was consistently higher than the previous 300y period, yet similar to the 300y period before that. OHC could easily be expected to buffer global changes an respond on a multi-centennial scale. Activity ramped up in mid 1700s and remained high. This would be consistent with a multi-century warming as a result on increased solar. The lower activity between 1250 and 1700 would seem consistent with the hypothesis that LIA was of solar origin. Here is the SN Mulitmessenger with a 100 year triple running mean filter. The progressive increase of the last 3 centuries and the LIA timing seems to match quite closely to the proxy. [MODS]Perhaps you could promote this to visible image. > The reason for stopping in 1885 was that the (Suess 1955) effect of extensive fossil fuel burning makes it problematic to use 14C data after the mid-19th century; in addition, radiocarbon data cannot be used after the 1950s because of nuclear explosions that led to massive production of 14C. It is always a pleasure when real scientists do the right thing. No attempts to “adjust” for the known disruption like some do with Urban Heat island effects. No attempts to graft two data sets like the “hockey stick.” Open acknowledgement of the data matrix being sparse in places. If the rest of the field were as professional as this paper the understanding of climate would be decades ahead. Why not just tack on real life data to the end of the proxy chart for the remaining years. Ja. Ja. I seem to remember that Leif was sceptical about Gleissberg 87 years. Click on my name to figure it out for yourself. Except that the 88-year cycle has not benn visible the last 400 years. And as with Tom but nowhere else Halla (above), that’s inconvenient. Last 400 years? Or roughly, not seen since the Maunder Minimum? I don’t believe that the 88 years cycle appearing in most of 9000 years of data is a statistical fluke. What changed? Exactly when is the 15th century minimum? The 1690’s were of course a famously cold interval, but the 1430’s may have been just as bad, though there are much fewer sources. I remember Lamb telling about how he tried to figure out just which winter in the 1430’s it was that was so extremely cold, since the records seemed to be conflicting, until he realized they all were! In Leif’s Fig 3, the Spörer Minimum starts around AD 1430 rather than the previously 14C-derived 1460. So the new reconstruction passes that test. Although I’ve also seen AD 1420 for its onset. Leif’s latest shows the Oort and Wolf Minima about where previously recovered. My latest figures for the past GB cycle put it at 86.5 yrs. Admittedly it is not 100 % constant as it depends a bit on a number factors. It would be helpful have a really dumbed-down summary of the key take-aways for the nonscientific community. I’m not sure it could be dumbed down enough for me …..
Leif, many thanks for sharing this here. I greatly admire your accomplishments and have learned much from you website. Ditto, in spades. This is really good stuff. We are witnessing real progress being made. This is excellent. Thanks very much for the article and for posting it here. Probably a silly question from a mining engineer/geologist: looking at the fourier analysis, are the peaks at multiples of a single Gleissberg cycle supportive of peaks at near 200y, etc.,? Figure 2 shows a 1950 mid century optimum Modern Optimum after which solar activity despite a bump in the 1990s is on the decline corresponding nicely to the rapid mode of atmospheric circulation since the 1970s well known climatic shift (see https://hacenearezkifr.files.wordpress.com/2018/05/leroux-1993c.pdf ) . 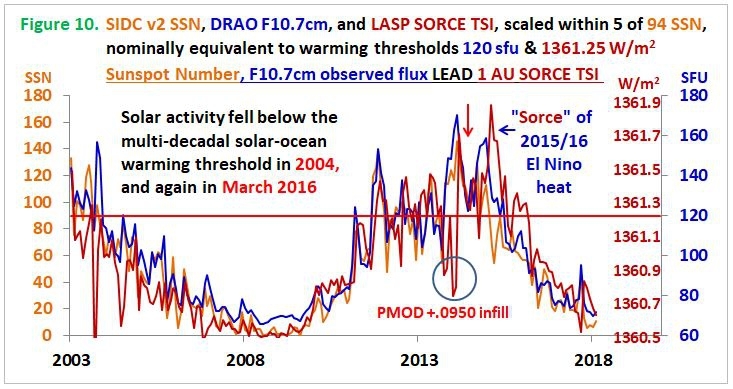 Figure 3 shows the solar activity coming out of the LIA is on an uptick, despite the absence of the large unprecedented modern grand maximum claimed by some and abundantly debunked by Leif, but still on a clear undeniable uptick, compatible with the 0.8 C warming known. The minimum is centered around 1500 AD. The Medieval Warm Period shows up nicely before that. 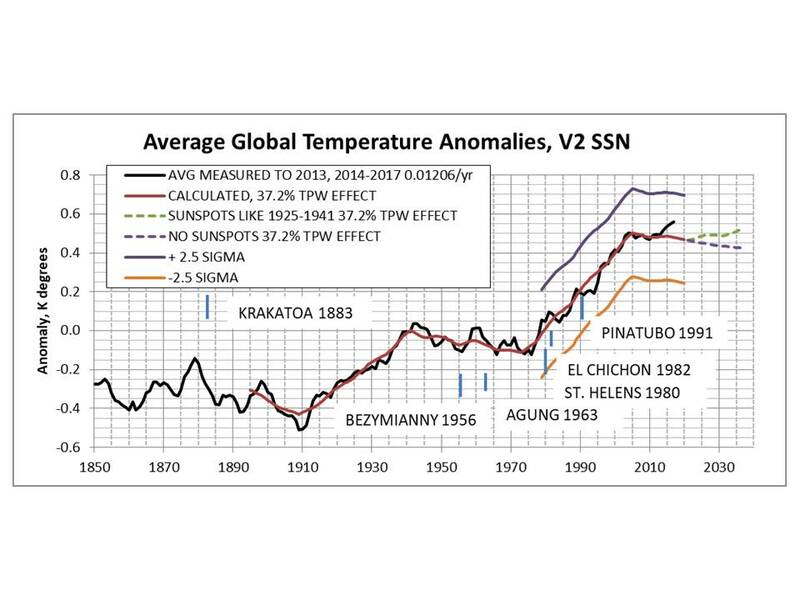 In Figure 4, the Roman Warm Period is clearly visible as is the HCO corresponding to favorable conditions leading to the emergence of civilization in Mesopotamia and Egypt. Only man made global temperature algorithms that popped up during the Adjustocene 2000 period do not fit this work. It could be the deleterious effects of the evil CO2 gas because doubting the Global Temperature output would be heresy… or simply that the climatic changes observed that are compatible with the solar data invalidated the CO2 ruler of the world claim. So thank you Dr. for this great reconstruction. One of the big reasons why CAGW and the ensuing nonsense has been bad for all of scientific inquiry. Hi doc, long time no see. Yes, that was a bit of a red flag for me too, though 10 is a binary division. I see no mention of taper window being applied so artifacts will be strong. I will try to do some alternative spectral analysis and see what comes out. That’s PR and validation is all about. I have done a chirp-z analysis on the autocorrelation fn of SN using a different window functions and find a clear peak at 87.8 years. specral analysis of a-c produces the power spectrum rather than simple F.A. Kaiser-Bessel; extended cosine windows and o windowing, all clearly show this peak at the same value. It appears real and strong. strongest at 207 years, also 355a. longer periodicities at circa 500a and 1600-1700a . Taking the first and last 500 data points, thus breaking the sub-multiple of 878, produces the same peak. It is only about half as strong in the later data but still stands out from the noise and very close to the same period. My main worry with this is way Wu et al resampled the data at 10 year intervals and whether this has introduced aliasing with the circa 11y Hale cycle. That could produce aliasing of the order of centuries. Does anyone have a link or the title of that paper? Leif that is some really nice useful work for understanding the climate. Imagine a straight line at 94 v2 SSN across Figures 3 & 4. Activity above that line means a warmer climate, and below it a colder climate. 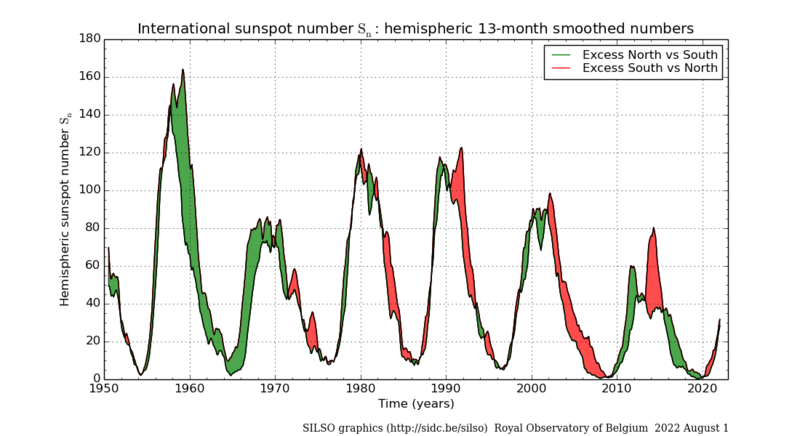 What strikes me is the sunspot number time series irregularity, with significant long low periods, but with somewhat similar rates of increase and decrease throughout, indicating sporadic yet consistent solar processes. Similar slope rates like in Figure 4 are also evident in ice core data. Long-term solar irregularity prevents us from realistically being able to forecast climate change beyond a single solar cycle. All anyone can do beyond that is create what-if scenarios. I’ve updated the head post with the correct address. Many thanks for including the data. It seems that there should be some relevance to the claim that the work is supposed to disprove earlier claims that solar activity had increased in recent times. The dots do not connect themselves (for me at least). Is the point intended to be that recent warming is not to be explained by increased solar activity? I apologize if this question demonstrates my ignorance. Leif, I agree with Vukcevic above. The “87.6” Fourier result is absolutely an artefact of the Fourier analysis. In neither case is there an 87.6-year cycle. It’s one of the problems with standard Fourier analysis. It only samples it at a relatively small number of points, so things get aliased to the nearest point. Percy, I don’t use the FFT (Fast Fourier Transform) that Dr. Svalgaard uses. I use a different type of Fourier transform. I invented it myself, and I called it the “Slow Fourier Transform“. I later found out here thanks to Tamino that it was first used in the 1980’s. It’s called a “Date-Compensated Discrete Fourier Transform”, or DCDFT (Ferraz-Mello, S. 1981, Astron. J., 86, 619). (Sometimes people ask me if it bothers me when I invent something and then find out later that someone invented it before me. Quite the opposite—it proves two things. First, it proves that my method is a correct one, and second, it proves that I actually understand what I’m doing, or I couldn’t have invented it … but I digress). In any case, a regular FFT only samples the signal at a small number of periods. The DCDFT samples at as many periods as you’d like. As a result, it is not subject to the kind of error that caught Dr. Svalgaard above. The Gleissberg Cycle is just another name for centennial solar minima, quoted as between 80 and 130 years. The long term astronomical mean is 107.9 years. There is a clear and strong peak at 87.8y in the full dataset. It’s about half as strong in the later 5ka of data but still there and still centered on exactly the same frequency. It can be seen on a higher resolution plot to be a well defined peak, if your analysis only has 80,90,100 you will not see how broad/fine the peak is. There seems to be a consistent feature as 150 years too. He just presents the numeric value of a computation. around 90 years. Which does not appear in your periodograms but does in Dr. Svalgaard. Thanks, Percy. Not sure what claim you are referring to. Note that you get better resolution at the shorter periods, and bad resolution at longer periods. So yes, you will indeed get a result at “around 90 years”, in fact at 85 years… but that is a result of the length of the signal. If you want to get better resolution, particularly at longer periods, you need to pad your data with zeros … lots of zeros. Finally, I window the signal using a Hamming filter … otherwise you get artifacts. “An alert reader, Michael Gordon, pointed out that I was doing a type Fast Fourier Transform (FFT) … and provided a link to Nick Stokes’ R code to verify that indeed, my results are identical to the periodogram of his Fast Fourier Transform. So, it turns out that what I’ve invented can be best described as the “Slow Fourier Transform”, since it does exactly what the FFT does”. So again if your method gives exactly the same answer as a normal Fourier transform then your result and Dr. Svalgaard’s should agree. But they don’t and hence either your method is different in which case you are not calculating the periodogram of data or else one of you have made an error in the calculations. 107.9 years is the long term mean for the synodic cycles that order centennial solar minima. What jumps out visibly is the LIA. It’s more the three “hard cores” of the LIA 1430-1440, 1690-1700 and 1800-1820 that jumps out visibly. Yup. The depths of the three solar minima mentioned below, with the coldest decade of the 1690s associated with the low point of the Maunder. I think the “1690s” is a little too precise. Dates of Frost Fairs in London indicate that, assuming (for argument’s sake and nothing more) that the frequency of Frost Fairs reflects a general level of coolness, the period from 1650 through 1700 was very cold in Britain with six Frost Fairs, and the last quarter of the 18th century coming second(?) with four. 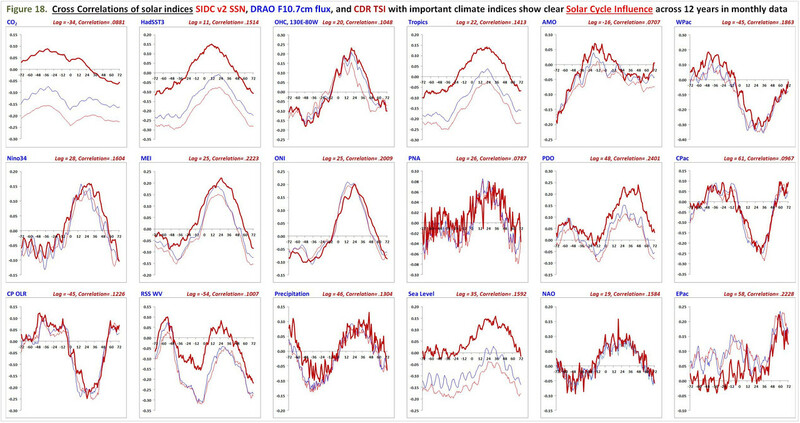 If the LIA followed RIA patterns, the 18th C pulse might have been the coldest. And, since the Delaware River was frozen over at least one winter during that same 18th C span, it seems possible that the LIA “coolness” really did extend beyond Europe. Sadly, as Willis notes – not many thermometers around. There were thermometers in the 1690s, although Fahrenheit’s scale wasn’t adopted as standard until 1714. The CET, which starts in 1659, shows the 1690s as the coldest decade. But the coldest winter of the Maunder Minimum was the Great Frost of 1708-09. Yes … which makes any claims of prior temperatures questionable. See below. For the first six decades to 1720 the figures are printed in italics as an indication that they must be considered less reliable, based as they are on extrapolation from the results of readings of highly imperfect instruments in uncertain exposures at a considerable distance, generally in south-east England; or on estimates based on interpretations of daily observations of wind and weather. Until June 1666 and from October 1667 to October 1668 daily observations are largely lacking. Before 1671 instrumental readings are few; accordingly all values before 1671 have been rounded to whole degrees C. Regular thermometer readings begin again in 1672. From 1671 onward more than one series of daily wind-and-weather observations are in general available and the majority of monthly means have been rounded to 0·5 deg C. Estimates, however, are still necessary for much of 1671, for July 1677 to August 1678, June to August and November 1695, June and November 1696, June 1697. From 1707 onward, although there are several English sets of daily observations in increasing detail, and these now include northern England, very few thermometer readings have yet been found. A general control for 1707- 1722 is best established from a careful analysis of observed snowfall frequency and from the overlapping series of monthly means representative of Utrecht in Holland, coupled with wind directions. The reduction of a series of approximate outdoor monthly means, from a consideration of these earliest meteorological journals using crudely made and clumsy thermometers indoors has been described elsewhere (Manley 1961, 1963); it is only the fascination of the chase that takes one into the nightmare assemblage of daily observations with which Conyers, for example, filled his little notebooks between 1673 and 1680. We do have, nevertheless, the very consistent diary, giving a continuous sequence of non-instrumental observations through the whole period (November 1668–December 1700) that was kept in Westminster by John Gad bury; and there are several others, e.g. by Elias Ash mole (Lambeth 1677- 1685) and John Locke (1666- 1667 at Oxford, thereafter several fragments, e.g. in 1682; and continued by him at Oates, near Ongar, through most of the months 1692-1703). Outside London we have very little. Christopher Sanderson, of Eggleston in Teesdale, has a valuable if somewhat broken sequence of daily non-instrumental observations, 1682- 1689 (MS., Gateshead Library) and Sir Philip Skippon’s journal, from Wrentham in Suffolk, includes barometer and thermometer readings through most of 1673 to 1674 (Margary 1927). Richard Towneley is known to have kept daily observations near Burnley in Lancashire, but I have not succeeded in finding them. They are, however, mentioned here in the hope that others in time may succeed. At present, any estimate for ‘Central England’ before 1708 must still depend largely, if not entirely, on extrapolation from the monthly means deduced for the London area; these in turn are manifestly subject to a variety of sources of error, although in regard to the winter half-year they receive some general control through comparison of the decadal means of the frequency of days with snow. And although later observations are better, from beginning to end the CET is an average of varying numbers of stations in varying locations … and when you have that, you can’t compare different times in the record, because they are records from different thermometers in different areas, sometimes estimated from anecdotes of things like snowfall and personal diaries, and sometimes not even from Central England at all. As a result, you simply cannot say that the 1690s were the “coldest decade” … the records we have don’t support that. From the year 1658. Let’s just say that the waterways between the Danish isles don’t freeze over like that anymore. In the middle of December the weather shifted, turning into the coldest winter in memory. The seawater between the islands froze, making a ship-borne assault impossible. Engineer Erik Dahlberg was dispatched by the king to ascertain whether the ice would support the weight of the Swedish cavalry and artillery. Dahlberg reported that a crossing over the ice was feasible. Early in the morning of 30 January 1658, the army was lined up to cross the Little Belt to reach Funen. The army consisted of about 9,000 cavalrymen and 3,000 foot soldiers. The ice warped under the weight of the soldiers; on occasions water reached up to the men’s knees. Close to the shore of Funen a skirmish broke out with about 3,000 Danish defenders, but these were brushed aside quickly and the army was safe on Funen. Now investigations were made to find the best way over the ice that covered the Great Belt in order to reach Zealand. Again Erik Dahlberg led the investigation, and he advised taking the longer route via Langeland and Lolland rather than the more direct route across the Belt. The night of 5 February the king set off with the cavalry across the ice and safely reached Lolland later in the day. The infantry and the artillery followed the next day. Thus, on 8 February, the Swedish host was safely on Zealand, and on 15 February, after forced marches, it reached the outskirts of Copenhagen. The Danes, who had thought the Swedes would start their offensive in the spring at the earliest, panicked and yielded. Negotiations were started and on 26 February the Treaty of Roskilde was signed by the two parties. While less well attested, many historians believe that the barbarian horde which crossed the Rhine at Mainz into Gaul on 31 December 406 did so over ice. The mixed lot of Vandals, Alans and Suebi then destroyed Roman cities, leading to the collapse of imperial power in northern Gaul. This was early in the Dark Ages Cool Period, which followed the Roman Warm Period. The worst year of this period was arguably AD 540, “when tree rings suggest greatly retarded growth, the sun appeared dimmed for more than a year, temperatures dropped in Ireland, Great Britain, Siberia, North and South America, fruit didn’t ripen, and snow fell in the summer in southern Europe (Baillie in Singer and Avery, 2007). Towards the end of the period, in AD 800, the Black Sea froze and in 829 the Nile River froze (Oliver, 1973)”. The LIA is distinguished by a series of solar minima, with sunspot recoveries between them. As with centennial-scale warm periods, cool periods experience counter-trend cycles. Some assign the Wolf Minimum to the Medieval WP as a counter-trend cycle, because it was followed by another pronounced warm cycle. But others date the LIA from its onset. In any case, the LIA is marked by at least the Spörer, Maunder and Dalton Minima. Coming out of the solar lows can produce pronounced warming cycles, as during the early 17th century, during recovery from the Maunder. Another note. 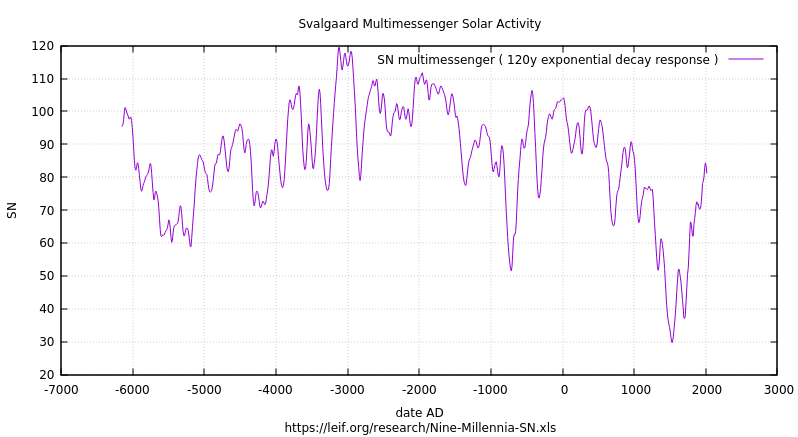 Here are the actual yearly sunspots, the Gaussian average of the yearly sunspots, and the Svalgaard reconstruction. What is southern Hemisphere in comparison to NH? Most notable difference is no contiguous MWP …. Study after study has found a globally coherent Medieval WP. Same goes for South America. Besides of course the many sites all over the NH showing the same signal. Not really. The climatic optimum was earlier in the Holocene, partly beyond this reconstruction. IMO, it’s visible in Fig. 4. It appears to end abruptly some 5 Ka, with a nose-dive in solar activity. Thanks for another useful and thought provoking article. My only disappointment is that Leif has apparently succumbed to the new childish NASA trend of referring to observations as “messengers”, presumably referring to the new field of “Multi Messenger Astronomy”. Obviously use of the new buzz word and latest jargon ensures that the papers will be published and favourably regarded by the new generation of trendy graduates. Why the need for this dumbing down? What was wrong with multiple “signals” or “frequencies”, etc.? I’m sure Leif has the intellect and experience to think up a more appropriate term. So they can blame messenger when the global warming goes pear shape. The fun continues. Here are the CEEMD and periodogram analyses of the long Svalgaard reconstruction, 6755 BCE to present. Once again, no putative 87.6 year “Gleissberg Cycle”. In fact, there is very little evidence of any strong cycles. Besides, the longer we cling to this joke of a standard model (which is not actually a model, but a patchwork of science and gibberish) we won’t understand it either. Same for earth’s climate evolution, which is why all that Paleo bunk from the Pages community is meaningless even if it was (it isn’t) accurate. Indeed Mark, cycles start to sound epicycles when people are obsessed with finding them. Willis though, I’d like you to reiterate why the visible peak is not a putative 88 year cycle? Artefact, why exactly? What is the limit of significance? Eyeballing doesn’t help here. Maybe the obsession with cycles has something to do with the regularity of Earth’s planetary motions – from the daily spin on it’s axis to the annual tour around the sun? Many humans seem to have a strong desire to find a reason for everything, & also love to predict what will happen next. obsession with cycles is because it gives the possibility of prediction. Saying I have a chaotic system that I do not understand does not get us far. That is not to say stable cycles do exist, but that is the reason for what you call obsession with cycles. 89 (Gleissberg), 104 (CEEMD only), 130 (Periodogram only), 150, 210 (de Vries), 230 (periodogram only), 355, 440, 505, 700, and 900-970 (Eddy) years. There is even a hint of a peak at 2300 years (Hallstadt). 88 (Gleissberg), 104, 130, 150, 209, 232, 351, 445, and 505 years. Their wavelet analysis shows that these periods are not stationary (i.e. they fad in an out with time). For example, the 208-year period is prominent during periods associated with grand solar minima, that occur roughly once every 2000-3000 years. I would say that Leif’s data and your analysis confirms the earlier results of Abreu et al. (2012). Once again, no putative 87.6 year “Gleissberg Cycle”. Power density spectrum from chirp-z analysis of the auto-correlation fn gives a fairly strong , consistent and well defined peak at 87.8 years. Though I am not sure whether anything else is strong enough to suggest cycles in a phsically causal sense. Everything has “cycles” in a periodic analysis. That was sort of my conclusion as well. Even the 11-year Schwabe cycle is not a ‘cycle’ but an ‘eruption’. Around the statistical solar minimum two eruptions run in parallel: one at low latitudes and one in high to mid-latitudes. The length of an eription is typically 17 or so years. Each eruption leaves behind the debris of which the next eruption will develop. No cycles here. Enjoying your work, especially figure 8.8 for those cycling enthusiasts. The length of an eription is typically 17 or so years. Each eruption leaves behind the debris of which the next eruption will develop. No cycles here. The length of the event has little to do with the periodicity, I find this line of argument confused. If I have a Hall effect pickup on crank of my car engine the pulse will be very short but that tells me nothing about the repetition cycle which gives the RPM. If the Hall pulse was 2/3 of the repeat interval the rpm would still be the same and would still be a cycle. It is interesting to point out the nature and duration of the eruption but this does not deny the repetitive nature of these events. A lot of the problem is how the cycle lengths are determined from poorly defined minima. There is not one peak in a Schwabe cycle but too. Sometimes they are barely distinguishable, sometimes clearly separated. A better characterisation of the cycle would help understand and measure it. The cross-over of two opposing tails is not a very useful criterion for Schwabe cycle length. I can’t help but feel that you guys are just re-inventing the wheel. Go and have a look at Abreu et al. 2012 (Ref: Abreu, J.A., Beer, J., Ferriz-Mas, A., McCracken, K.G. and Steinhilber, F., 2012, Is there a planetary influence on solar activity?, Astron. & Astrophys., 548, A88). These authors do a full wavelet analysis [which I believe is the best way to investigate this data] and they clearly show that most of the periods that you find in your analysis are indeed present, however, they are non-stationary i.e. they fad in and out over time. Some of the cycles fade in and out in a systematic way e.g. the 210 de Vries cycle is only present during periods of grand solar minima. Ruling out cyclical behavior simply because it is non-stationary is to me, the hallmark of a scientific hack. I know that you are fully aware of most of the following. I am just thinking out loud in order to clarify my thoughts on this topic. Long-term non-stationary cycles can be produced if you have fundamental (short-term) cyclical forcing terms with variable intensity. The varying intensity of the fundamental cycle may be intrinsic (e.g. the cyclic forcing may randomly/periodically synchronizing itself with a natural cycle within the system under study) or it can vary in intensity because the fundamental forcing cycle interacts with other fundamental forcing cycles that could be present. Here is a bit of speculation that I think will make my point. First, let’s be very conservative and limit our analysis to cycle with periods that are less than roughly 1/20th of the data length i.e. ~ less than 500 years. Using this limit means that we can get a reasonable handle on a non-stationary 500-year cycle if it is present for about 50 % of the length of the data record. Step 2 —> 504.50 years etc. etc. Note that this 208-year cycle could account for the 89 years, 104 years (= 208.0/2 years) 150 years, 210 years, 230 years, 355 years, 440 years, and 505 years cycles found by Willis. I know that many here will be ROTFL at this point but I have made a claimed that the level of solar activity is modulated by the gravitational torques of (primarily) Jupiter acting upon the tidal bulges near the base of the convective layers of the Sun that are produced by the periodic alignments of the Earth/Moon system with Venus. The hypothesis is called the Venus-Earth-Moon-Jupiter Tidal Torquing model. a) the 239 year period – which is associated transit cycle of Earth and Venus. b) the 31.0, 28.75 and 59.7 (= 28.75 + 31.0 years = 59.75 years) periods – which are associated with the alignments of the Perigean Full/New Moon tidal cycles with the Earth’s orbital period (which produce the seasons). Hi Ian. I don’t follow what your “steps” are about here. J-V seems a reasonable thing to investigate. JVE at a stretch, JVEM and I suspect you getting into over-fitting and any result is spurious coincidence ( aka numerology ). One thing that has struck me as odd is that the various basic lunar periods are close to the solar equatorial rotation, though that has to be Sun -> Moon influence or common cause if anything. I doubt the moon is doing much to the Sun. One thing I have never managed to fathom out is that the mean frequency of Saros eclipse period (~18.6y) and lunar apsidal precession ~8.84y is very , very close to the orbital frequency of Jupiter. This suggests to me that there is some kind of orbital connection between J and lunar precession but I have never managed to untangle what is going on. 89, 104, 130, 150, 210, 230, 355, 440, and 505. 1. Imagine if have a 239-year cycle that starts at -31 years. 2. Step forward by 59.75 years from the starting point at -31 years. I have great admiration for your no-nonsense scientific reasoning. It is like a breath of fresh air at times. However, could you read the following paper by Frank Stefani et al. 2018 about the Tayler-Spruit model of the Solar Dynamo. It is based upon my VEJ tidal-torquing model for driving solar activity. The solar cycle appears to be remarkably synchronized with the gravitational torques exerted by the tidally dominant planets Venus, Earth and Jupiter. Recently, a possible synchronization mechanism was proposed that relies on the intrinsic helicity oscillation of the current-driven Tayler instability which can be stoked by tidal-like perturbations with a period of 11.07 years. Inserted into a simple α – Ω dynamo model these resonantly excited helicity oscillations led to a 22.14 years dynamo cycle. Here, we assess various alternative mechanisms of synchronization. Specifically we study a simple time-delay model of Babcock–Leighton type dynamos and ask whether periodic changes of either the minimal amplitude for rising toroidal flux tubes or the Ω effect could eventually lead to synchronization. In contrast to the easy and robust synchronizability of Tayler–Spruit dynamo models, our answer for those Babcock–Leighton type models is less propitious. I guess “proxy” although accurate, is out of vogue? Based on your evidence I would conclude that Solar activity is a complex non-linear phenomenon. Predicting it might be impossible. Connecting Space weather to weather on Earth is a scientific question that could be more interesting. How often will a Solar storm hit on Earth and what are the consequences? People here still go looking for cycles in chaos. It is a pointless and meaningless exercise. One assumes the suns interior is a boiling turbulent mass of plasma and that it is intensely chaotic. Prediction of chaotic systems cannot be done with any degree of accuracy, and they do not display cyclic behaviour except by accident, so to speak. Incompletely or insufficiently characterized and unwieldy. There may be observable or inferred, even reproducible, cycles in limited frames of reference; but, generally, we have to acknowledge that accuracy is inversely proportional to the product of time and space offsets, forward and backward, and all around. We have difficulty predicting a human life, other than conception, death, and several intermediate milestones. We have barely made near-observation at the edge of our solar system. In chaos theory, you look for strange attractors rather than cycles. Example, Lorenz attractor derived from Lorenz equations for atmospheric convection. Applying it to the sun, formulate “solar equations” and look for a “solar attractor.” If the equations obey some conservation laws, there are corresponding mathematical symmetries to be discovered. This is Noether’s theorem. This is how particle physicists built the Standard Model by searching for mathematical symmetries. My guess is the Navier-Stokes equations combined with Fermi-Dirac statistics could describe the plasma flow in the sun. Sometimes there’s subtle connection between seemingly unrelated fields. Example, I’m applying Bose-Einstein statistics to black holes. I think it could explain or modify Hawking radiation. So if you want to introduced orbital period or oscillations into solar energy can you please at least refer to current theories not deceased classical physics which we already know is wrong. If you want to use gravitational energy which obeys classical laws then fine you can use classical theory but you can not mix and match. Choose which energy, which determines which theory covers it and apply it. Magnetohydrodynamics is a classical theory. Fermi-Dirac statistics approaches the classical Maxwell-Boltzmann statistics in the limit of high temperature and low particle density. It’s chaos theory in classical physics. Once we understand this and apply it to solar physics, then you can be more ambitious and try reformulating it in terms of quantum chaos. However, we do successfully forecast and model weather. Which means the under-laying processes are not opaque, or beyond useful projections, despite chaos. Precise sampling is of course the key to projecting for a few days, at a level of detail that is clearly usable. Weather forecasting is like drawing a straight line with a French Curve. One can do so for a short interval, but. . . Does not Boiling imply the requirement that there be condensed matter and an attendant phase change? One can see the prolonged solar minimums are still present and with that the climate correlations. One can see the LIA corresponding to the low solar activity from this latest revision. This keeps the basic premises intact but what really matters is where solar goes from here. I maintained the sun has now entered a period of inactivity post 2005 as opposed to a very active period prior to that time. This is not the first nor will it be the last revision. If above sequence holds true then a deep / grand minimum is on cards, as I argued 15 and number of the subsequent years, but at the time it was dismissed as a bit of nonsense, and probably still is . 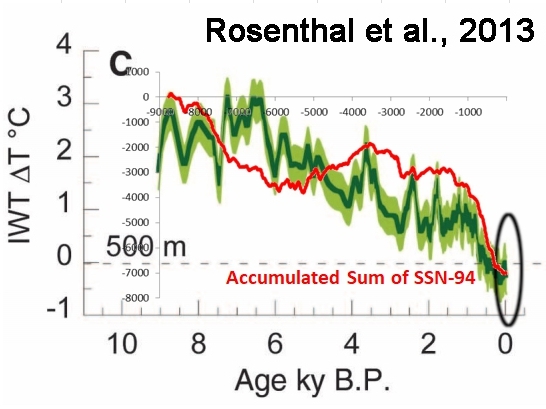 Figure 5 shows that the Hallstatt Cycle (found in climate records) is not significant in the solar record. Because your “half” records are only about 4300 years, can we really expect to find a 2300-2500 year cycle in them with FFT? The total record is 8770, which is long enough and it shows up in that record, as well as in Willis’ CMEED analysis above. that there has not been any significant secular change (e.g. an often claimed increase) over the same time interval, the lack of which had already been established (e.g. Clette et al. 2014). I see a potential secular increase from 1690-1700 (one of the worst decades of the LIA). In this decade there were famines in France, Norway, Sweden, Estonia and Finland. 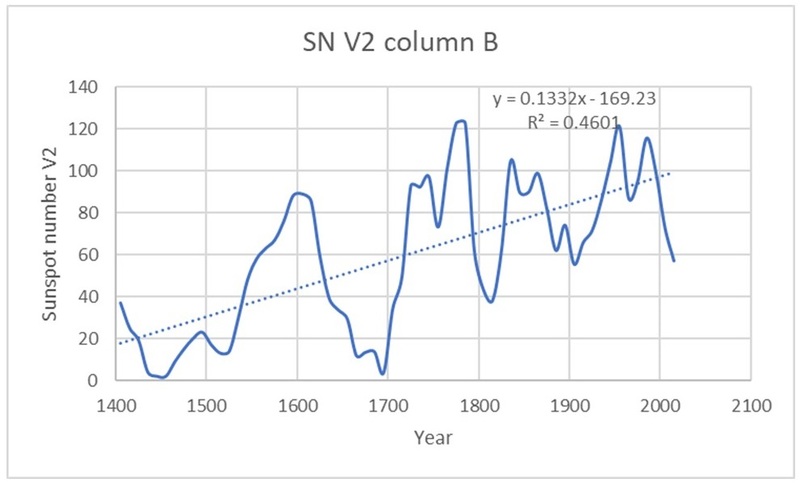 If one looks at your SN V2 record back to 1400, the trend to 2015 is 13 sunspots per century. The trend is not statistically significant due to the cycles you mention, but certainly possible. Your statement that it does not exist seems to overreach the data. SN V2 record back to 1400? By cherry picking a starting point you can get any trend you want. Does not mean anything. The secular trend you refer to in your post, is generally considered to be a trend of increased solar activity from the lows seen in the Little Ice Age. According to the Encyclopedia Britannica, the LIA was roughly from 1250-1850. The deepest parts of the LIA in Europe and North America were from 1450-1540, 1645-1715, and 1800-1820. The very coldest period was from 1645-1715, by all accounts. You can pick any starting point between 1400 and 1700 and get a positive trend. The correlation between SN and time is not good, but the trend is clear. The trend prior to the LIA is negative as the world goes into the LIA. I would say that if solar activity over last 300y had been higher than over the previous 300y, there is prima facia evidence for that be a cause of warming over the latter period. There is no reason to expect instantaneous equilibration of OHC. What interests me about low solar activity is how it can be linked to climate change. Now what’s becoming clear is the effect it has on the jet stream and blocking patterns. During low solar activity the global jet stream becomes more looping and unstable. This combined with increased jet stream activity in the Arctic leads to more movement of the air masses between the pole and the warmer south. These changes to the jet stream aid the formation of “northern blocking patterns” and deep swings in the jet stream. The weather records during the LIA suggest that the same thing was also happening during this time when the solar activity was also low. So this winter should be of interest to climate science as it seems to be shaping to forming a LIA winter weather pattern in the NH. With blocking over the northern Atlantic/northern europe and the NE Pacific/NW north America area. Exactly. And even the Climate Numptys are beginning to understand that the sun has a powerful effect on climate, yet they still cling to the notion that CO2 will make any cool-down much more muted, and when solar activity ramps up again, in say 30-40 years, then, watch out because CO2 will have a double-whammy effect. As if. Yes l don’t pay alot of attention to CO2 as a driver of climate change. Changes to the jet stream and weather patterning is where my focus is, as this is giving insight as to how these changes can increase cloud cover. lt can do this in two ways. One is the increasing the amount of colder air flowing over warm oceans is leading to more cloud cover over the oceans. Second is the increased looping of the jet stream is causing a increase in “cut off lows”. Which drives cloud cover and rain further to the south then would otherwise be the case. Where this cloud cover leads to more cooling then it otherwise would do if it remained further to the north. Ions produced by cosmic rays have been thought to influence aerosols and clouds. In this study, the effect of ionization on the growth of aerosols into cloud condensation nuclei is investigated theoretically and experimentally. We show that the mass-flux of small ions can constitute an important addition to the growth caused by condensation of neutral molecules. Under atmospheric conditions the growth from ions can constitute several percent of the neutral growth. We performed experimental studies which quantify the effect of ions on the growth of aerosols between nucleation and sizes >20 nm and find good agreement with theory. Ion-induced condensation should be of importance not just in Earth’s present day atmosphere for the growth of aerosols into cloud condensation nuclei under pristine marine conditions, but also under elevated atmospheric ionization caused by increased supernova activity. they would have a point if it wasn’t likely that co2 levels will drop due to ocean sequestration during a cool period. Leif, thank you very much for the reconstruction, the paper, and the data. Sorry to intervene, but can I just as a question, as a layman please? It seems to me the discussion revolves around solar activity relative to global temperatures. Observation of both go back hundreds of years but, to my mind, the further back in time we go the more questionable the data. Just how many people were observing solar activity in the 1400’s and what equipment were they using? And judging by the political implications of climate change today, what might have been the political or, indeed more likely, the religious influences of the last few centuries? Conducting scientific experiments that contradicted religious beliefs in the 15th Century would have been a perilous occupation. So again, to my mind, the number of practitioners and the quality of data is entirely suspect. Much like temperature data compiled from the last few hundred years of observations which was localised with no QC and no eye to the global significance, the data from the 15th Century would surely be suspect. Satellite’s and Argo buoys are churning out data we are led to believe is reliable but even that seems contaminated by calibration, drift, and failure errors. Stevenson screens have only lately been updated to digital technology and even some of them can’t be relied on because of UHI misplacement. SST’s were taken, likely up until the late 19th Century by cabin boys chucking buckets overboard, to no defined depths, along well plied trade routes. How can we rely on those as historical data? We have sophisticated satellite technology today such as Hubble (which still goes wrong). What was available in the 15th Century? Telescopes that cost a fortune, with hand ground lenses that were by today’s standards, rudimentary at best, peering through city smog. And taking the example of hurricanes/tornadoes, and comparing the incidence and strength of them today, relative to 18th or 19th Century records is nonsense as most events in the past went unseen. Today all hurricanes are observed and tracked thanks to technology not available 100 years ago. Homogenisation (if that’s the correct term) of historical data is misleading, if not down right dishonest. 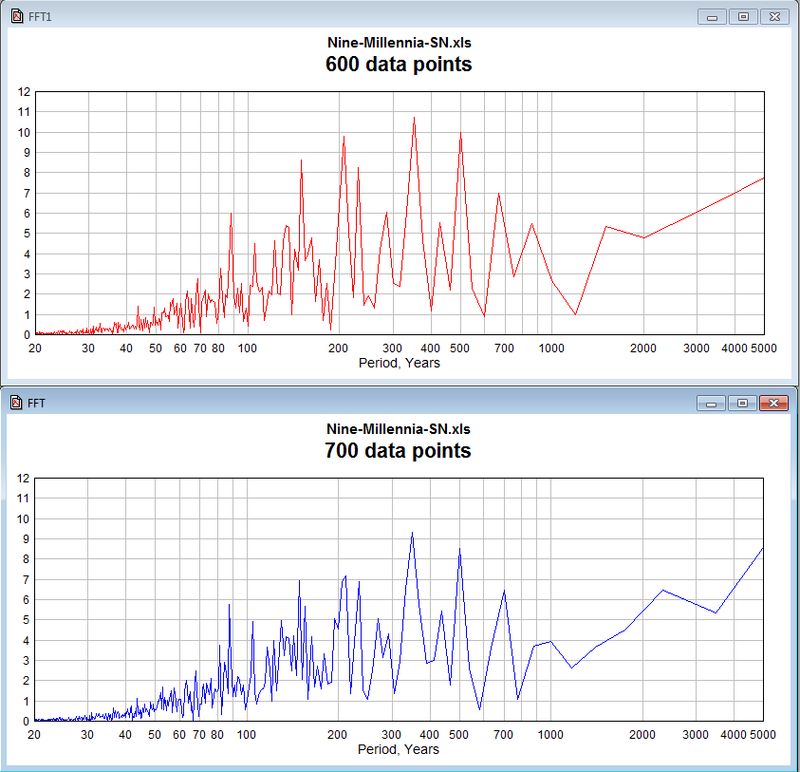 Accepting data from even the last 100 years relative to climate change, solar activity etc. is just science making stuff up. The internal combustion engine was popularised just over 100 years ago, but no one in their right mind would determine the course of modern transport based almost entirely on the data from that time. As I said, I’m a layman so my comments are probably entirely off beam. But if I think like this after years of simple research into climate change, how can we expect laymen who haven’t bothered to research the subject understand the significance of data from a bygone era? Often modern science is tangled in the data that the faint outline of the big picture is either ignored or dismissed as irrelevant. but understandably they had no technology so alternative – Ptolemy geocentric system was worked out, not ideal but good enough to observe and predict planetary movements linked to river Nile flood cycles, look up Nilometer they had built for the purpose. NASA’s JPL scientist Dr. Joan Feynman (yes, sister of Richard, often quoted on these pages) wrote a paper, available on line free. Vuk. Your SSN link suggests solar cycle 25 could be about two thirds the size of SC24. Is that your ecpectation also ? PS. It’d be nice if you could update some of your magnrtic field versus temperature graphs p!ease. Thanks for your interest. There are dozen if not more, it’s time consuming process, finding old files on my pc and data on line creating new graphics etc but at least earth magnetic field is changing slowly so for anything less than a decade it would not make much difference. I might eventually get to it at least for one or two. Think ice cores and tree rings. Or try reading the introduction. Leif asks the question–“periodic activity?”–without any due recognition that no one is claiming strict periodicity even for the Schwabe or Hale cycles, let alone much longer ones of great interest to climatic variability. And then he applies periodogram analysis (with results plotted misleadingly as a function of period) to provide a straw-man answer to his loaded question. What remains to be determined is whether there are significant oscillations of sunspots that are coherent with the chaotic oscillations found in climate (see, e.g. https://journals.ametsoc.org/doi/10.1175/1520-0469%281996%29053%3C2786%3ACOOTCA%3E2.0.CO%3B2). This requires the application of well-founded cross-spectrum analysis methods that decompose the signal power (variance) into fairly narrow frequency bands and exhibit the coherence and relative phase in those bands. There is wide analytic recognition that raw periodogram analyses are grossly inadequate for that purpose, even when the results are correctly treated as a function of frequency. Would volcanic eruptions interfere in any significant way with the 10Be and 14C messengers? Well, if there was no atmosphere, no precipitations and of course no volcanic eruptions then one could say that 10Be and 14C are good proxies for solar activity, but as it is they are only good proxies for 10Be and 14C deposits, but for solar activity as good or as bad as you wish. My result was similar: it doesn’t reproduce the holocene temperature history. This convergence of the recent cosmogenic and solar activity records (see also Muscheler et al. 2016) lends credence to the admissibility of making a leap of faith back to the beginning of the WEA reconstruction nine millennia ago, Figure 4, even if we have to admit that it is not clear if the very long-period variations are of solar origin..
It’s clear as mud whether or not 9000 years of decadal solar estimates are climate-useful. I doubt a long term integral would work anyways since it requires a good long term calibration that could be offset by unknowns. But if you slice the function to bits and integrate them, matching the C every millennia separately, can you force a fit? Not thst I’d believe this. Long term integral is valid. Realize the present condition of the natural world is the integration of past anomalies (difference from a reference value) which can vary both positive and negative over time. This is a measure of the INFLUENCE of something represented by the proxy of sunspot numbers. The influence of other factors, e.g. earth temperature, could be combined but IMO much would necessarily be left unexplained. Doug, you are right that you need to integrate power to get to an energy term, like temperature. However, a simple integral is not very balanced since the early part is very sensitive to new values while, near the end even very large swings will have no visible influence because they cannot swing the 9000 year sum. 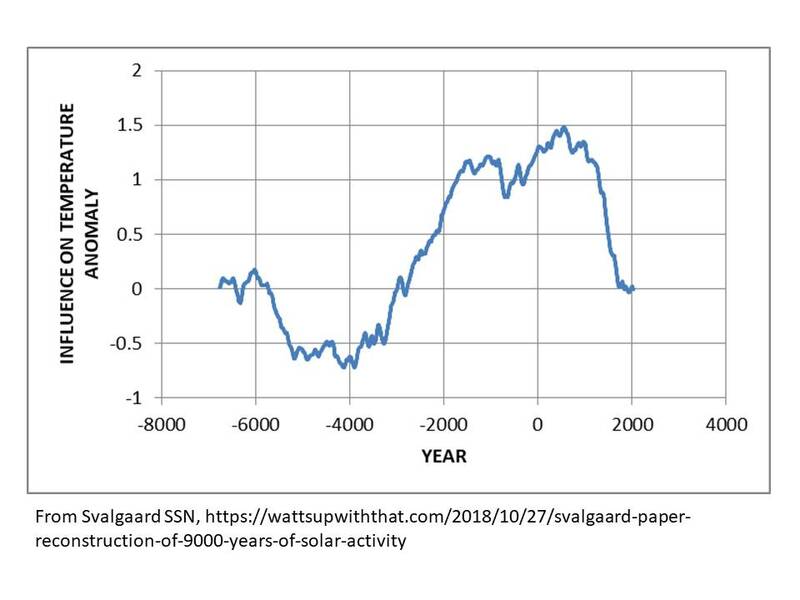 If you want to know whether solar had any contribution to LIA and recent warming, clubbing it together with what happened 9000 year ago will not be informative. You need some kind of down weighting of older values whose influence has long dissipated. Climate is not a perfect thermal capacitor. It will react and deal with changes in input ( neg. feedbacks , stability , etc. ) So we know old values have been digested and are no longer relevant. One way to do that is by using an exponentially reducing kernel to do a weighted average. The is equivalent to a simple negative f/b response. You then need to choose a time constant and decide whether you need just one or have several processes and reservoirs. If you take a simplistic ‘pot on a stove’ you can use such a kernel to process the power input from a flame into a temperature response. Each forcing, whether first or last is ‘swinging’ the effective thermal capacitance, not the previous sum. Realize that the ‘sum’ is of anomalies i.e. the recorded SSN minus a reference SSN. The difference can be either positive or negative so the integral (cumulative sum) will fluctuate up and down as time progresses (see the graph in the link above). Because each interval (in this numerical integration, the interval is 10 years) in an integration starts where the previous interval left off it is unclear what you mean by ‘clubbing together’. Climate is not a capacitor at all. Any combination of capacitors in series and/or parallel can be reduced to a single effective capacitance. The significantly participating part of the planet has an effective thermal capacitance of about 17 W yr /m^2/K. A competent transient thermal analysis automatically accounts for all forcings, feedbacks, etc. I have done many. [A] simple integral is not very balanced since the early part is very sensitive to new values while, near the end even very large swings will have no visible influence because they cannot swing the 9000 year sum. Perhaps using the decadal numbers this way has inherent issues. Here is a closer fit to Pacific intermediate water heat content from Rosentheal, et al 2013 when using the undetrended accumulation of sunspot number minus 94. Subtracting 94 from SSN results in the down slope. I used 86 which makes beginning and end points about equal. IMO the Rosentheal, et al fit has the same issues. I don’t expect perfection at this resolution as the data “error bars have error bars”. The accumulated solar anomaly above/below my threshold works well since the LIA. Why is the direction “right”? In what way does it “work well”. What you are in fact saying is that it , in some rough way, matches your preconceived bias that SSN should explain temperature. You arbitrarily rig your processing to achieve this and then decide it must be right because it agrees with your expectations. You expectation is SSN , others prefer CO2. Thank you for a perfect example of the bias confirmation which has been plaguing the whole of climatology for the last 30 or 40 years. You are an abusive man, and I’m going to abuse you right back. The right trend direction? And if it wasn’t in the right direction then what? Are you dumb? Work well since the LIA? Yes it does. When did you show it didn’t. You arbitrarily rig your processing to achieve this and then decide it must be right because it agrees with your expectations. No sir. I used 94 as my threshold, which I determined empirically in 2014, tested and explained here many many times. What you’ve done here is absolutely told a lie, and you’ve clearly shown me you cannot be counted on to tell the truth. You’re a liar. There is no bias in my work. From start to finish everything was tested. You’ve had your fun with FFTs today now you can crawl back in your hole. Let’s just get this right out in the open Greg. Since you’re not in agreement with SSN, are you saying here that you are among the “others” preferring CO2? Yes or no. Tell the truth Greg. Are you a warmist? Do you actually think CO2 drives temperatures? Are you lumping yourself in with the false safety of the herd that believes the impossible, something that can only happen if everyone lies to themselves and others? I would love to know that you’re not that dumb. Click my name for the full story. Dan that is excellent, thank you. Naturally, I attribute water vapor & ocean cycles to solar… 😉 Today I also followed a hunch that paid off. Recent Maxima are not unprecedented. But in a 9 millenia reconstruction, what is “recent”? The 1450 Sporer and 1695 Maunder minima appear as without precedent in the last 9000 years. Are those “recent”? The question for policy makers is how likely are we to revisit those cooling minima in the near future? The pseudoscience of climate science religion has blinded humanity and policy makers to the risk of cold periods like the Maunder. Cold kills, cold brings starvations and societal collapses. Warmer never has. If he LIA is a first of its kind in 5he Holocene, it may be a tingling foretaste of the next glacial period that likely lies ahead. The LIA was not the first of its kind. Ever since the end of the Holocene Climate Optimum, warm intervals, such as the Minoan, Roman and Medieval WPs, have been followed by cool ones, such as the Greek Dark Ages, the Barbarian Invasion Dark Ages and LIA. Fig 3, one huge Oort Minimum, but the deep solar minimum from the 1120’s is entirely absent. The 1500’s looks back to front compared to NW Europe climate, which was very warm in the 1530’s and colder from the 1550’s. Fig 4, no sign of the Super Solar Minima from around 2225 BC and 1250 BC that caused widespread desiccation and civilisation decline. No sign of any major minimum during the Early Antique Little Ice Age from around 350 AD either. Important policy decisions should not be swayed by guesswork. We have seen to much damage from this in the last few decades. Some folks guess that dumping c02 into my air will have no effect. Do you know any such folks? Unless you do and understand their attitudes, not much merit in your one-liner, is there? we are making progress if all scientists can agree on this. I didnt say it was poison, now did I. On rare occasions I have suggested that a value of zero is not excluded from the range of sensitivity values such as ECS relating air temperature to changes in atmospheric CO2, or vice versa. If you are possessed of knowledge to disabuse me of this notion, let us all hear it. At a level beyond the IPCC AR5 simplistic cop-out of declining to publish a figure and way beyond Arrhenius. Steven, a best unbiased scientific guess so far is that increased CO2 appears to be hugely net positive, also a huge surprise for death-to-planet worriers. “The Great Greening^ тм” (think all that doomed habitat we were worrying about), bumper crops, drought resistant vegetation big sequestration of atmospheric carbon and some of the sun’s energy (endothermic event) and it’s exponential in development so far. Now starting tomorrow it may turn on us in some savage, unimagined way, but at a minimum it teaches You university and government clime industry folk, a) CO2 as an air commodity doesn’t appear to be all bad as you had thought and b) the potential heating, even if the models and theory were halfway correct, is going to be notably deprived of this rapidly sequestering gas. This and other teaching moments, like the Dreaded Pause, sadly will be left falliw and you will go to your grave without a discovery and advancenent since Tyndall. Apparently, the natural evolution of human society toward the harnessing of the best available sources of energy was “pure guesswork”! A staggering oversimplification of lifetimes of effort and investigation leading to the understanding and utilization of thermodynamics. This work has been massively to the benefit of ALL mankind. What aspects, if any, would anyone in their right mind want to throw away? Some folks (wrongly) imagine that the Precautionary Principle applies to CO2, a beneficial gas, further imagining that spending $trillions on reducing said beneficial gas is not an idiotic as well as harmful pursuit. Dumping CO2 into your air? Narcissistic much? You’re doing it yourself. And your friends & family. And any beloved pets you might have. And any aerobic life for that matter. Mosher, you & your ilk are SO over the top….. Indeed. Your air, Steve? No no no no no. It’s my air! I have a piece of paper here that says so. I paid $7.62 plus shipping for the air, so it’s all MINE!! I bought it through Ronco along with my Popeil’s Pocket Fisherman and Rotisserie. The UN/IPCC policy guarantees CO2 levels will increase….how is that different? The air you breathe is yours? I have done family-duty today, so have only time for a few comments. 1) IMHO this is the best solar activity reconstruction we have at the moment. 2) About the 87.6-year ‘cycle’: is it an artifact because the dataset is precisely 10 times as long? Well, it is also seen in the three subsets of ‘halves’. And with any other subsets you may care to choose. The 87.6-year peak is still strong. I would point out that it is IMPOSSIBLE to determine changes in solar activity via proxy measurements, because of varying interference from volcanic SO2 aerosols (tiny droplets of H2SO4) in the atmosphere. When they are present, they intercept much of the incoming cosmic radiation, resulting in reduced Be and C isotopic formation, and giving the false impression that solar output has decreased. And vice versa. This can be proven by examination of the graph “Solar Irradiance, 1880-present”, which was constructed from proxy measurements (it can be Googled). It shows, for example, a solar minima between 1983-1986, which coincides with the 1984-85 La Nina (caused by increased atmospheric SO2 levels from the El Chicon eruptions of 3-29-82 (VEI4+) and 4-3-82 (VEI5). 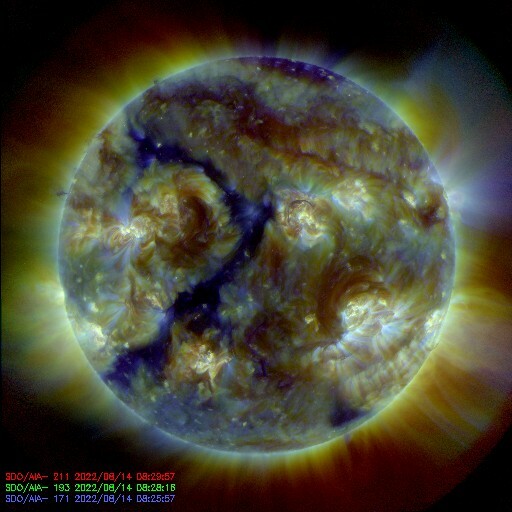 It also shows a large solar maximum (again. for example) between 1985 and 1995, which coincides with the El Ninos of 1986-88, 1991-92, and 1994-95, all of which were caused by reductions in the amount of atmospheric SO2 aerosol levels. Thus, these changes, attributed to changes in solar output, were instead caused by changes in atmospheric SO2 aerosol levels, which changed the magnitude of the proxy measurements, and led to erroneous conclusions. Further, satellite TSI measurements are available for the above periods, and they show no corresponding changes in solar output! The proxy measurements, however, should be useful in determining changing amounts of large volcanic activity over the centuries. Is it just me ,as a layman, but as if there is sort of “kinetic energy” in warming when compared to the sunspots? They will get your money. One way or another. I was able to replicate Dr. Svalgaard’s FFT plot with the raw data — but only without windowing. Maybe I’m wrong about that (please correct me), but it looks to me like no window was used. Not using a window will in general result in excess noise and sometimes even extraneous signals showing up in the result. There’s a good reason not to use a single periodogram to analyze the power spectral density (PSD) of a supposed stochastic signal. The periodogram is not a consistent estimator. In fact, the longer the data record input to a periodogram, the noiser the result becomes. See Chapter 11 in “Digital Signal Processing” by Oppenheim and Schafer for the math on that. There is a long enough data record here (almost 900 points) to use something like Welch’s method (ibid, Chapter 11 or search Wikipedia for Welch’s method) of averaging several shorter (overlapping) periodograms. For example using the pwelch function in Matlab shows three main peaks around 88, 150 and 220 years. There’s a fourth peak around 370 years, but the FFT’s frequency resolution might be a bit low to put too much store in that. In summary, I am not weighing in on the question of whether an FFT is the best way to analyze this data. However if an FFT is to be used, I suggest that windowing is a really good idea and averaging periodograms (e.g. Welch’s method) is an even better one. I am usually not a fan of cycles, as they require that the sun has some kind of memory, which is hard in a roiling and convecting plasma. I do spectral analysis with a method (we discussed few years ago) I and a colleague designed for looking at high frequency communication signals since we found that the Fourier was prone to costly errors (in design engineering not tolerated for very long). As it happens I’m about a thousand miles away from my desktop pc (writing this on a mobile phone) but when i get back I will have a look at data and email the result if anything interesting comes out. However sun is not an island of the solar system to itself, it has an enormous effect on it but it is not entirely isolated from a feedback from IT’S system, nature of things is such. As for the cycle discussion, it would seem that the Eddy cycle is in fact present if one looks closely (fig. 5). Leif, what is known about the physical source of the ( relavively) stability of the 22 a Schwabe Cycle? What kind of memory works in this case? Each Hale cycle of 22 is a quarter of the GB 87. The whole GB is one sinewave exactly as I have illustrated although it appears that each GB may not be exactly the same as the previous one. vuk, I didn’t question the cycle… but what reason is given that the Schwabe cycle is 22 years long and not say 30 ? Or the other way around: Is it cycle longer or shorter when looking at other “main line stars” ( in the Herzsprung-Russel Diagram). And why is the cycle as stable as it seems to be? Your guess is as good as anyone’s. My guess would be that sun as a rotating fluid would have some effect similar to our Rossby wave that appears at mid-latitudes, as the sunspots initially do, but due to sun’s size and rate of rotation it may take around couple decades to subside. External synchronization may be a stabilizing factor but since it can’t be proven it is just a guess. Let’s say planet J takes 23.7 years to orbit twice and another planet let’s call it S lines up with J at just under 19.8 years which averages arithmetically at 21.8 or geometrically at 21.7 or most likely it is the periodic beat of two at 10.8 years. There’s not much noise left and only periods where there is consistent energy over most of the record remain. And again — I am not weighing in on whether FFTs (i.e. cycles) are an appropriate behavior to look for. This is specifically a comment on effective use of DSP tools. I so long for the day when I stop these types of signal processing errors in climate science, that should have been learned in first year of grad school in a signal processing class. Are we all going to make the same class of mistakes as Mann on both sides of the debate? M. Jean-Baptiste Joseph Fourier must be spinning in his grave both from abuse of his discovery of the GHE and from misuse of his mathematics. No moving average is my paper. I long for the day when people take the trouble to read what is posted. Prove meaning getting as close to the objective truth as possible, and you know that. Why you of all people talk about “science” is beyond me. You’re not scientifically minded. As close to objective truth as possible? Steven wrote “yes you have to assume physics doesnt change”. No Steven, YOU have to prove, for example, that a flux of cosmogenic isotopes does NOT change, or changes in a way that can be closely reconstructed. I said nought about changing laws of physics. Nice article overall with one exception: Japan proved that solar energy output doesn’t correlate to sunspots and isn’t connected. Got a link? I don’t believe that claim at all. Nice work Lief. Thank you. But there is a but. The time period 9000 yrs of only the present warm period doesn’t tell the whole story. Someone would have to go back a few ice ages and compare sun activity during their warm period to the present warm period to any trend. Then, I think, that person would have to adjust for the the earth’s tilt and wobble to find any trend between sun spots and warm spells. 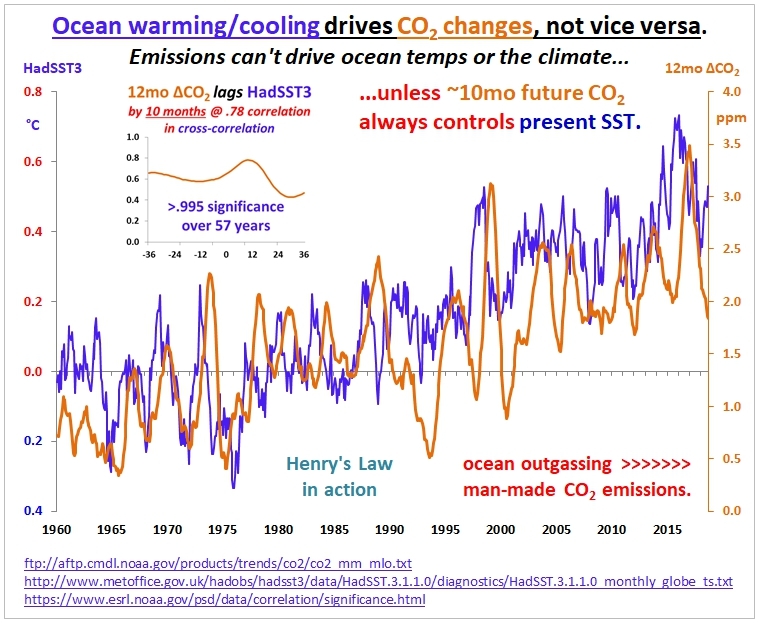 Cycles become circular arguments when leaving out the oceans….again. And when the oceans do slip into the the discussion there is not even the suggestion that ocean cycles further modify input cycles or how. The circular arguments will continue until the oceans are better understood beyond ENSO and other short term mechanisms. The oceans are the principle transmission mechanism for solar energy to the atmosphere. Unless these mechanisms are understood, and integrated with the ocean cycles, no understanding of climate is possible. the oceans determine average T by large, due to the water cycle, which keeps the global T stable and more constant. Therefore it is difficult to see the GB cycle in Tmean. I then cross correlated this with solar polar magnetic field strengths. This is part of ‘the solar cycle influence’ on the ocean (my work) that establish the conditions for what I’ve named a ‘solar cycle onset’ ENSO, as in ’09/10. During a solar cycle minimum, tropical evaporation is minimal from low TSI, with fewer clouds, allowing more sunshine in to recharge the ocean. The ENSO then ensues strongly upon the rapid rise in TSI at the onset of the next cycle. The solar cycle influence on sea surface temperatures goes beyond ENSOs and other short-term mechanisms to explain the long-term accumulation of ocean heat as a function of solar activity. Well, this is a good a place as any. Whatever produces cycles of solar activity must act independently on the earth and its oceans and atmosphere, and even on its crust and mantel as well. Since the moon is important in these interactions for the earth, but not for the sun, there will be influences on the earth that are not directly related to solar activity. Among these would be ENSO, AMO, PDO, etc., etc. These additional interactions would confuse any attempt to tie the earth’s climate directly to solar activity. But solar activity remains a primary driver nonetheless. It’s just that there are other factors involved. there will be influences on the earth that are not directly related to solar activity. Among these would be ENSO, AMO, PDO, etc., etc. These additional interactions would confuse any attempt to tie the earth’s climate directly to solar activity. The confusion lies in not recognizing the solar forcing of the ENSO, AMO, and PDO, and then giving them each a forcing attribution separate from solar. The PDO is directly tied to solar cycle driven ENSO activity (similar correlation), and the AMO is more an accumulation over time function. The basin sizes differ too. This solar line of inquiry is interesting, useful and important, but if we are looking too desperately for patterns I fear we will fool ourselves. Even just the near surface of the Earth including the atmosphere, the top 200 feet of ocean water, all the lakes and glacial ice and the top 20 or so feet represent a huge heat sink which must introduce a very important lag on the temperature effect of solar input changes. Since we quite obviously don’t know the quantity or value of all the inputs and feedbacks, or in many cases even the sign, the patterns will only become clear as we build better knowledge of these so they can be factored out of the temperature signal. Additionally, we need to throw out bogus aspects of past temperature signals such as tree ring proxies or anything else vomited up by Michael Mann. The problem with any reconstruction is nailing down the geo magnetic field . Even today the data is not very good much less way back then. I mean: We knew what was happening? The sign used in front of 210 and 86.5 here means ‘about’ , so it is an indication of: give or take ‘some time’? Anyway, I am glad that Leif is convinced now that the GB cycle does exist. I am personally convinced that the switch to the new GB cycle occurred when the solar polar field strengths were at lowest and we had a double flip over of the sun’s poles, i.e. 2014. And certainly not visible today. but 350 year long CET data record shows strong components about 70 and 90 years which may be averaged in 10Be deposits, having in mind possible errors in the older CET data and poor 10 Be proxy resolution. Thus, the ‘Gleissberg cycle’ which appeas only in the proxy data is of climate but not of solar activity origin, since we know, and has been demonstrated by number of respected papers that the 10Be rate of deposition is very much subject of precipitation intensity. For last few days my younger one was in Joburg and will be on the way to Windhoek and onward to Oranjemund. Much warmer there than what appears to be in London at the moment. Vuk, u r here in SA? You r welcome to visit. We have the pool if it gets too hot. Not me Henry, I’m in south of France, it’s my daughter on business. 10Be rate of deposition is very much subject of precipitation intensity. But does not explain why the other proxies agree well with the 10Be the last 400 years. Botom line: to 88-year power since 1600 AD. I am not sure if 10 year proxy resolution make any sense at 3ky BP, according to BGS the paleo magnetic proxies accuracy is around + & -20y/millennium. Ice cores should be more accurate but diffusion may still be greater than assumed +&- 5y at 3ky and further back. You will want a good sample resolution even if your uncertainty is larger. I would be more worried with actually reading Wu et al to see what the data looked like before resampling at 10y and how they processed that. There maybe sufficient physical smoothing in the various proxies to average out the Schwabe cycle but if it is just erratically spaced data without physical smoothing before sampling this could lead to aliasing issues producing spurious long term , centennial cycles. Does anyone have a link to an accessible copy of Wu et al? Looking at the last 200 data in the multimessanger there are two perfectly matched peaks at p1=0.2009993;p2=0.214972 centuries: 20.1 and 21.5 years. Such a pair in spectral analysis suggests amplitude modulation, in this case modulation period of 618 years. These base frequencies is very close to the Nyquist frequency but should be detectable. The point there is that if Hale is detectable , Schwabe may be present also and may be aliasing. It appears that considerable amount of time ‘synchronization’ was done to march various proxy curves, is this legitimate practice? Greg see my note to you on Scottish sunspots thread. 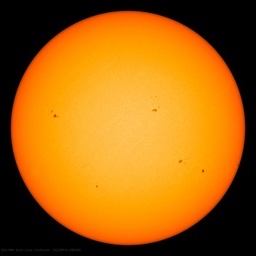 When sunspots are discussed, there is speculation about periodicity and the alleged influence of activity on climate. I suspect that Leif regards the relative amplitudes of a series of solar cycles as random. I have often wondered whether there is a solar system gravitational (or perhaps magnetic field) influence on the turbulence of the fluid gaseous and plasma substance of our sun. The cause of solar variability and whether or not it follows any pattern is probably quite a separate issue to whether it has an influence on climate. This second possibility is very unlikely to reveal itself in any simple correlation. It seems that a sequence of very low activity or very high activity is necessary to produce any effect. This is not surprising in a system which is essentially cyclical. If every cycle is identical the system will not change substantially over time. If a series of cycles are low in amplitude, then the mean average over time will decrease. Of course, SSN is just a proxy. It is an indicator of the magnetic tortuosity of our star and the influences, whether magnetic, electromagnetic, or physical that emanate from our star to interact with our planet and others in the solar system. I refer to microwaves, charged subatomic particles, visible light, UV and magnetic fields. We do not fully understand all the ways in which these influences interact with our climate. That last sentence sums up why I think that this particular aspect of climate science is far from settled. Re cycles: Perhaps a litte off the wall, but the fact the sun is spherical and its surface a boundary and it has polar axes upon which it turns ~25day period on the surface, and it has an 11 yr sunspot cycle and itself wobbles and rotates about a barycenter as it ‘swings’ its planets about it, it would seem more remarkable than not at all if it DIDN’T display cycles. Appealing to ‘chaotic’ all the time is a copout. The universe was even more chaotic to Neanderthals than it is today. So the stuff of the sun is a plasma. Hey we have variable stars – some have argued all stars are more or less variable and they are made out of the very same plasma. One reason cycles that must be are not unequivocally measurable at the surface of the earth could well have more to do with contrariness of our atmosphere (Le Châtelier Principle?). Willis E. noted that there is no sign of a heating and cooling cycle on the planet caused by the ellipticalness of the earth’s orbit. The cycle is real but the earth neutralizes it by making more or fewer clouds. Actually with all the motions taking place on/in the sun, and fairly regular polar reversals, I would look for “cycles of cycles of cycles” (I dont know how I would do this!) and would not expect a simple regular frequency linear with time. It seems naive to expect such and a thriwing up of arms to apoeal to chaos. Obviously cycles and chaos can co-exist. The seasons are cyclical. Weather is chaotic. All orbiting celestial bodies are cyclical. The three-body problem is chaotic. Magnetohydrodynamics of the sun is more chaotic than three orbiting bodies. Your “cycles of cycles of cycles” could just be a strange attractor. Yet another solar activity reconstruction, but this one is worth the time reading it just to see Leif saying he has found cycles in it. Those that seek shall find. Regretfully he finds the only cycle for which there is no evidence and can be clearly ruled out for the past 400 years. And fails to find the Bray cycle, that is so evident that even appears at IntCal13 calibration curves. Yes, the same curves that are used to calculate the age of ancient organic material, and that have been worked out by hundreds of scientists over many decades. 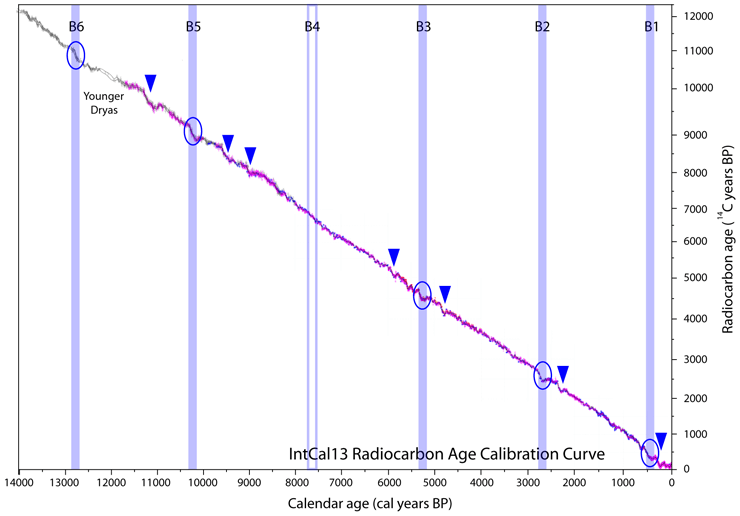 The lows of the Bray cycle are spaced ~ 2475 years and correspond to periods where it becomes difficult to calculate the age due to the deviation from linearity of the IntCal13 curve, at times when 14C production just went through the roof, i.e. particularly big grand solar minima, or clusters of them. Obviously somebody that hates cycles and doesn’t believe they happen in the Sun is not the right person to look for them or even discuss them. The way Gleissberg described his cycle is shameful. It has nothing to do with the centennial periodicity clearly visible in sunspot records and probably related to the bicentennial one. The 88-yr peak in frequency analysis is absent in the last millennia, and one of the golden rules is that if your hypothesis rests on the older less reliable part of the data, it is probably not true. It is in the data for sure, but that doesn’t mean that it is real. And if it was real, who cares, it hasn’t happened for thousands of years, so it has disappeared. Leif saying he has found a cycle. Now I think I have seen it all. Luckily, not everybody suffers from it. Leif, there is a new metric posted a SpaceWeather.com they are calling the Thermosphere Climate Index along with a reconstruction. Are you aware of this, and I would be interested in your take. They are linking it to changes in EUV . with a touch of geomagnetic [i.e. solar wind] contribution that also adds to the thermospheric activity. Oh the Bray blip. Maybe there will be another blip in 2000y, unless it is one of the blips which skips. Don’t expect to find such a short duration and small magnitude effect showing up in a periodogram. In addition what is going to happen going forward is what will matter not necessarily what has happened in the past which is always going to be subject to revisions, although we know the general picture which is prolonged low solar periods of time with out exception have always corresponded to lower overall global temperatures. It is plain as day. Regretfully he finds the only cycle for which there is no evidence and can be clearly ruled out for the past 400 years. Leif is apparently of the same opinion [not seeing the GB cycle in the last 400 years of ‘his’ data]. in current data of maxima and minima. Henry, I have nothing against a possible climate cycle c. 88-yr. I haven’t studied it. 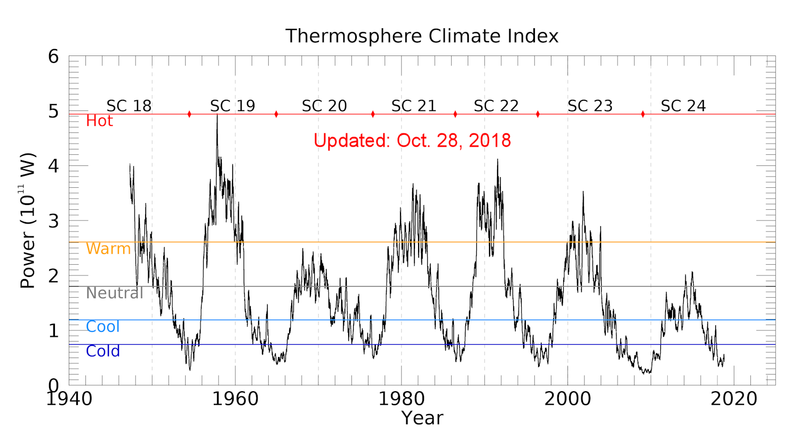 Although I am skeptical about climate cycles, as climate is so varied and complex over such a big planet that it is possible to find data to defend any cycle. But I have looked for the 88-yr cycle in solar data and I am a person favorably inclined to cycles, unlike Leif, and I have not found good evidence of it. Of course I’ve read Peristykh papers, but when he starts talking about secular smoothing to reveal the Gleissberg cycle in the data I can’t avoid to think about the N-ray confirmation bias. You don’t have to reveal solar cycles. They are very clear despite all the hand waving by Leif and Willis. The centennial, 214-yr, 1000-yr, and 2400-yr are everywhere. You find them just by checking the data from different sources, and there is a clear correspondence to climatic cycles. Other periodicities, including the 88-yr Gleissberg cycle, remain to be well established despite the abundant literature. Not a good sign. What more proof do you want just looking at the magnetic field strengths of the sun? don’t expect to see always straight correlation with what happens on the sun and what happens on earth. Expect to see jumps and lags depending on ….? as this is not clear anymore after me copying it on the internet. It originally came from one of Leif’s presentations. I remember that when he first showed it to me I was stunned to find that SSN and the solar polar field strengths are exactly inversely correlated. But diamonds are still a girl’s best friend. Is this an actual paper, or something with a bunch of made up science-sounding terminology? As with all Leif’s posts – I got homework to do. It has come to my mind that perhaps everyone skeptical of the GB cycle expects to see an exact response from the sun in the various relevant proxies on earth. Obviously, nature does not work like that. note tables II and III…. For one thing, although earth itself is generally cooling from inside to outside, since its creation, this process is by and large not ‘exactly’ constant, as I figured out from my own results. e.g. it seems to me that every 1000 years or so, the inside of earth re-aligns with the magnetic fields of the sun causing some extra warming in the NH leading to some extra Arctic and Greenland melting. Thanks for helping me learn how little I know. 🙂 I have some simple questions. If the maximum production of Be10 and C14 occurs during high cosmic ray flux at solar minimum, isn’t the proxy representing the solar cycle minimums instead of the solar cycle sunspot mean? Is there a relationship with the mean and the minimum? I understand the problem of taking 4.5 year ice core proxy data to develop a 9000 year sunspot history isn’t easy. It just seems like something is missing to delelope the proxy to solar cycle sunspot mean relationship. Sunspot cycle is highly variable where large swings may lead to incorrect conclusions. Yes, but when you turn the cosmic ray count into a sunspot number that inverse relation is automatically inverted, so that the sunspot count does represent activity.